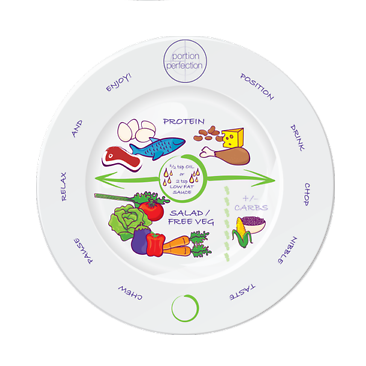 This plate is designed to help you portion your food consciously, the plate contains markings to help divide up food groups to better understand accurate serving sizes. The plate also features words around the circumference of the plate relate to satisfied and conscious eating. Markings to help divide up food groups into serving size. Lettering to help satisfied conscious eating.